Apricus Australia, the leading manufacturer and distributor of evacuated tube solar hot water solutions in Australia, recently implemented a centralised office recycling system, championed by engineer Christopher Nheu. As you would expect at a solar company, many staff members were already environmentally aware, but the organisation employed tools from NSW Environment Protections Authority's Bin Trim and Planet Ark's BusinessRecycling.com.au to help further inspire and educate staff and make recycling at work easier. Paper recycling was a particular focus for the company, with a number of actions taken to simplify the process. Plastic liners were removed from "next to desk" personal bins, so now all wet waste (food) is placed in kitchen bins to minimise contamination of paper recycling. Appropriate signage from BusinessRecycling.com.au has been posted above the bins. The size of the paper recycling collection bin was increased so that overflows wouldn't be placed in the General Waste bin, and all toilet bins now go to paper recycling. The warehouse also puts all cardboard packaging into the recycling bins. The company also introduced ‘Cartridges 4 Planet Ark' and MobileMuster phone recycling boxes to ensure that these electronic waste items can be disposed of responsibly. Chris Taylor, CEO and founder of Apricus Australia, said: "As a company which prides itself on providing premium yet affordable sustainable solutions, a deep concern for our environment and conservation of the natural world is embedded into our DNA. Renewable energy and sustainable waste management go hand in hand towards making this world a better place. Chris Nheu took it upon himself to initiate behaviour change in our office and the staff were really keen to take the recycling system on board." Chris Nheu explained: "For me, it was a no brainer. The environmental consultants working under the NSW EPA Bin Trim scheme were extremely friendly and provided free consultation on how to make our waste streams more sustainable. There was almost no effort required, just a slight modification to workplace behaviour. If anything, it has reduced the running costs for our cleaners and saved them time by not having to replace all the individual plastic liners!" 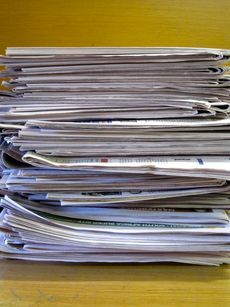 Read about other BusinessRecycling case studies.